So says Foxford, Mayo-born visual artist Katie Moore, whose cystic fibrosis has influenced her work not just in a very visible way – previous installations included hand-sewn hospital gowns – but in an invisible way. Growing up with cystic fibrosis and spending so much time in hospital has, she says, given her a sense of empathy for others, an empathy which seeps into her work. For her latest project, Entropy, Moore was inspired by the Tuam Mother and Baby Home. She was so moved and saddened by the discovery of remains on the site by Catherine Corless that she wanted to create a piece of art to reflect that. “She spoke about her experiences growing up with the children from the home but then she was also speaking a lot about her life,” she says. Moore went to visit the site in Tuam, which got her thinking “about connection to the soil and place, and I got looking at the soil and weeds and what was growing there”. She reflected on her many years babysitting when younger, and how she found what happened in Tuam “so scary – all the children I’m around are so loved and it’s so nice, which made me so sad”. 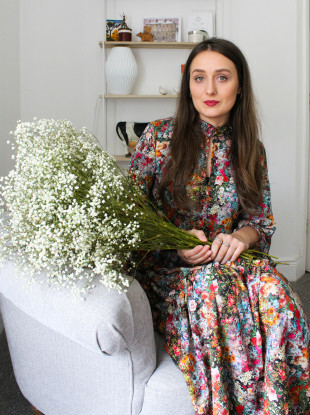 She observed the weeds that now grow at the site, and from there started to look at flowers – which led her to the flower gypsophila, known as ‘baby’s breath’. The resulting work is an installation about life, and death. It features hundreds of strands of baby’s breath. The white flowers are dried, but even in death they retain that sense of lightness and fragility they have while in bloom. For the installation, the flowers are suspended upside-down, while the sound of breathing fills the room. So because of her experiences – including spending two years in and out of hospital during the final two years of her degree – Moore has empathy with those who have suffered. For her, picking the Tuam Mother and Baby Home as a subject is a way of acknowledging the situation. Another project of hers, about Patrick Pearse’s prison cell, meant enlisting volunteers to help sew 22,000 fabric lilies together. In the final artwork, the lilies cascaded down to the floor. Today, Moore’s health is the same as it was during her time in college – it hasn’t improved, but she says she’s coping better with it. She’s even run a number of marathons to raise funds for a cystic fibrosis unit in Mayo. Living with cystic fibrosis often means campaigning for treatment or medication. Moore says she takes part in campaigns because she’s well enough to. “It’s disheartening [that we have to campaign], it definitely is but I guess you do just have to fight,” she says. She uses the cystic fibrosis unit in Mayo, but also attends hospital in Dublin every month. “Even though it’s difficult and crap, I am lucky I can walk,” says the artist. That’s why she uses her time and art to help others. Katie Moore‘s new installation Entropy will be exhibited at the Linenhall Arts Centre, Castlebar Friday 4 May – Saturday 2 June. Email “'Living with a longterm illness gives you this way of viewing the world'”. Feedback on “'Living with a longterm illness gives you this way of viewing the world'”.